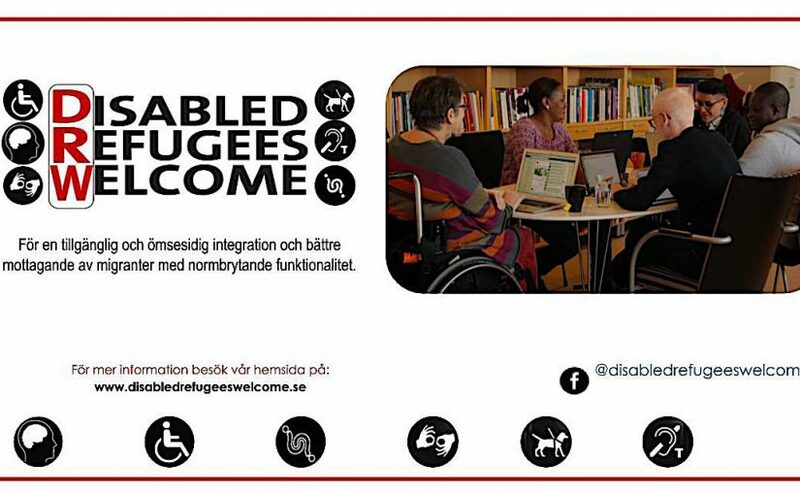 Wednesday the 14th of February 2018, Disabled Refugees Welcome held our first roundtable event with the City of Stockholm. Valentine’s day is a good day to share the issue close to our hearts – Welcoming Disabled Refugees. A roundtable is a method to achieve a horizontal way of communicating with the aim to change the dimensions of power to enable more open communication. DRW has used this method to start a dialogue with key agents for disability rights issues within governmental authorities, in a more efficient way. The roundtable was a success and resulted in a greater understanding for our respective activities, information on how we work with the target group newcomers with non-normative abilities, and brilliant tips on different ways on how we together can pursue our future cooperation. The first guest of this series of roundtables was the Stockholm Social Services Administration. DRW got to meet representatives for the department for overarching social issues in the city, where LSS-health is a part. Astrid Tornberg, a strategist on disability issues, mapped out the organisation and structure of the Social Services Administration. Noted during the conversation was that the Social Services Administration has a new department for the reception of newcomers. Paulina Slazak, strategist on social psychiatry and Anna von Rinder Beckerart researcher/strategist on refugee issues told us that the City of Stockholm has a budget allocation to develop peer support within the social psychiatry – work on developing this will be done in the North and South areas of the city. DRW also met Pia Ehnhage the Stockholm Disability Ombudsman. The ombudsman’s mission is, among other things, to be a support and complimentary driving force for the responsible committees and boards of the city within the scope of issues concerning living conditions and pre-conditions for the participation of disabled people. Pia Ehnhage said that the Disability programme ”Stockholm for all” – went on referral the 16th of February with a planned decision in the City Council in April. She emphasised some of the programme’s vital aspects that capture deficits, procedures, and includes advice and information to individuals. The programme is based on the National Action Plan with the goal that all public activities will be based on a disability rights perspective. Ingela Nilsson and Mia Grauers, representatives for Forum Carpe, also visited DRW’s roundtable. Forum Carpe’s mission is to coordinate and implement appropriate competence development for all the 26 municipalities within Stockholm County. This will be done by creating a network for experience exchange and awareness raising. Different ideas and proposals for how future cooperation between the city administration and DRW could look were collected during the second hour of the meeting. A mutual exchange of information where DRW supports the city with information and results gained in the project. Forum Carpe’s extensive county-based, as well as national network, could be used as a channel to reach the target group and to provide competence development with disability rights perspective within the scope of our work with newcomers. The administration spread information about DRW and will return with contact details of key-persons that the project team should have in our network. The Social Services Administration, department for reception of newcomers has an extensive network within the city and can provide the DRW team with the contacts for cooperation. The Social Services Administration’s strategists will inform the network for caseworkers about DRW, and the caseworkers will then inform newcomers they meet.